Last Wednesday, I was reading this article on Mashable about Facebook publisher when I thought it looked more and more like Twitter. No surprise then, when after two days, I was reading a second article on Facebook’s fan revealing the new Twitter-like features that Facebook will be unveiling for its publisher status bar. Facebook already had a Twitter application allowing its users to tweet without leaving their site, but this new step shows how Facebook is concerned about the recent traffic growth on Twitter (+40% between March and May 2009 according to compete.com). The imminent release of Facebook Search brings a whole new perspective in the search market, where people will be able to search real-time information on news, major events, and among the massive amount of data available on Facebook. The publisher bar allows Facebook users to share pretty much anything with their friends, but the new bar will feature an innovative option allowing them to expand the audience from a select group of friends to “everyone”. Looking deeper into this, I went to check on the Facebook Q&A page to understand what they actually mean by “everyone”, and it confirmed that “everyone” means “anyone on the Internet”. In other words, you will soon be able to tweet to your “fans” on Facebook. By the way, I find “fans” quite awkward as a term for “followers”, so please Facebook, try to come up with something a little bit less intense. It is now clear that Facebook is trying to counter-attack by enabling its users to have the same real-time feature offered by Twitter. The question is how this new feature is going to impact Twitter? Even if Twitter is a trendy topic on the Internet, its traffic is nowhere close to Facebook’s. Actually, a recent article on TechCrunch revealed how Facebook’s traffic is getting nearer to Google’s and even exceeded MSN’s. Besides, MySpace attracts more than twice as much unique visitors than Twitter! This reveals what people are really using, and if Twitter has experienced a fair growth in traffic recently, people don’t use it as much as its main competitors. TechCrunch has used compete.com as a reference, and so I did to forecast the future traffic for Facebook and Twitter using a simple linear rule – and it doesn’t look very promising for Twitter. It appears that Twitter has doubled its traffic between February and March, so it could probably happen again, but Twitter would need to see its present traffic multiplied by 6 to reach Facebook. But what I found really interesting was seeing the difference in impact for a major event like the recent death of Michael Jackson. You would assume in the first place that Twitter really is the best way to get real-time information and you would be right in a way, since the first information is said to have been tweeted, and not shared on Facebook. 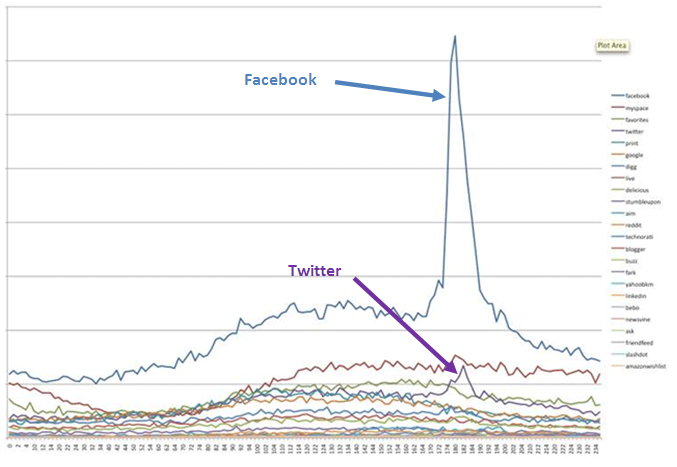 However according to this other article on Mashable about the web impact of Michael Jackson’s death, you can see on this graph how massive the impact has been on Facebook, and if you have a very good sight, you will be able to see the relatively minor impact of this event on Twitter (in purple). Facebook has recently announced the test of their brand new Facebook Search feature, allowing users to find content amongst the world’s largest online social media website. According to their statistics, more than 900 million photos are uploaded to the site each month, and more than 1 billion pieces of content are shared each week. Facebook has officially more than 200 million users, and if just 10% of these users choose to publish their status updates to “everyone”, it means that 20 million users will generate fresh search engine indexable content. Facebook couldn’t buy Twitter and is about to launch a service nearly identical, but based on a much bigger community. So will users who currently utilise both social networks consolidate their users? Given this, what will be the future of Twitter? Either way, from a SEO perspective, it will be interesting to see how the major companies react to these two real-time search engines. These 200 millions+ users are obviously quite tempting for the marketers, especially considering the amount of data Facebook has on each user. But so many questions remain regarding Facebook Search: Are the Facebook users really going to use Facebook Search? What is it going to index? Will it differentiate real-time results with static results in its SERPs? And why not Facebook Webmaster Tools, hey? The impact of such a potentially powerful tool for online marketing hot shots everywhere could bring a whole new perspective to the Search market. How much of the blue chip advertising budget is going to be spent on these new means of promotion? SEO firms might soon optimise companies’ pages and content for Facebook Search or even give recommendation on the right keywords to use for tweet copywriting. Now let’s see what impact such new features will have on the major search engines like Google considering that Facebook is attracting nearly as much traffic as Google. Thanks for your comments. Yes I thought about Facebook Search, and if you want to look deeper into it, you can check the Official Facebook Blog or this other article on Inside Facebook. Good post, but have you thought about Facebook Search before?